A third very popular type of arch bridge is the deck arch, in which the arch supports the deck from below. The arch in this type of bridge cannot rely on the deck to resist its large axial force and so it must be carried by the substructure and foundations instead. An example of this type of structure is the Alexander III Bridge in Paris, designed by Louis Jean Resal in 1899. As Fritz Leonhardt mentions in his excellent book 'Brucken,' the rise to span ratio of this arch is very flat (1/17), resulting in large longitudinal forces that must be resisted by the abutments. 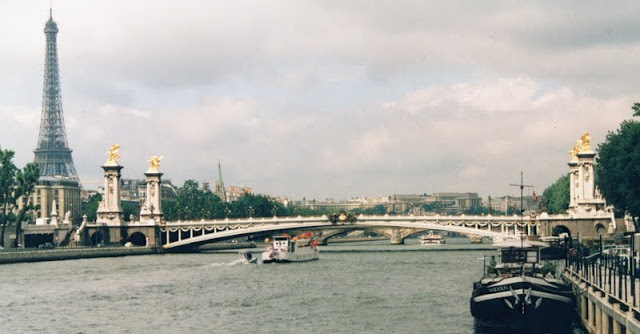 In this way, the bridge is able to cross the Seine in a single 107.5 meter span. The arch ribs are composed of cast iron I-sections that are covered in ornamentation reflecting the tastes of La Belle Epoque. Golden seraphim, candelabra, garlands, and coats of arms decorate the balustrades or sit on pedestals. A tower by another great bridge engineer of the period, Gustav Eiffel can be seen in the distance. Arch Bridges: Pont Alexander III by Mark Yashinsky is licensed under a Creative Commons Attribution 3.0 United States License.